ThatGameCompany has revealed that its three-years-in-the-making follow up to indie hit Flower is finally ready to go. Almost three years to the day after Flower blew away critics and players alike with its strikingly minimalistic and unique gameplay, indie studio ThatGameCompany is ready to release its next game, Journey, on PSN. This news comes after a previously announced delay made in September of last year. Journey, for those of you who don't know, follows the story of a desert traveler on, well, some type of journey across the sands. 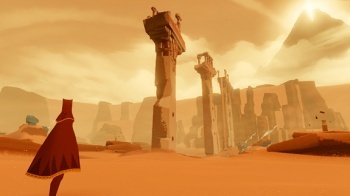 Along the way, players are joined by another wanderer (a PSN-plucked stranger), but are unable to communicate with him or her aside from actions and sounds. The game is now complete, but there's still no word on an official release date from Sony. "Sony's working on [a date]," tweeted Jenova Chen, the studio's creative leader, "[but there are] quite a few big releases coming up. Once Sony figures out the right time, they will announce it. I assume pretty soon." Still, the game is done, something that ThatGameStudio (and its fans) can appreciate. "Three years is a long time when you finally finish something and look back [and say,] 'What have I done in the past three years?'" mused Chen. "Hope it's worth it."